A great design in ergonomics leads to complete comfort when using the ProTeam Super Coach Pro 6 quart backpack vacuum. It comes with a FlexFit harness that moves in such a way to make wearing the vacuum on your back extra comfortable. This means less chance bumping into doorways and walls as you move around. The articulating harness lets you increase your range of motion, improve productivity, and reduce fatigue. The triangular shape of the body is designed to fit closer into the user's back making it feel less bulky and fatiguing. The die-cast aluminum tri-latch system assures air performance. Another feature is the exhaust is putting out aware from the user to keep you cooler while using the vac. Four level HEPA filtration is also a standard feature which captures 99.97% of particulates 0.3 microns or larger, improving IAQ (indoor air quality). 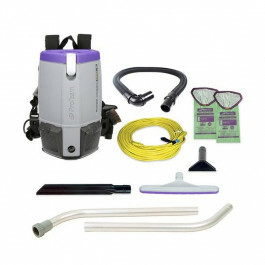 We also carry a slightly larger version of the ProTeam Super Coach 6: The Super Coach 10 quart HEPA backpack vac. And for other vacuums, please take a look through all of our HEPA Backpack Vacs if you're looking for other brands or capacities. This ProTeam backpack vac comes with 1.5" static-dissipating vacuum hose, a 50' extension cord, 2 Intercept Micro Filters, and your choice of tool kits (which are outlined below). It also carries an unmatched 3/3/3/Life warranty, which is 3 year on parts, labor and the motor, and life on the molded body parts of the vac. Dust Brush - 2 1/2"
Adapter Cuff - 1 1/4"
Customers who were interested in the ProTeam® Super Coach Pro 6 Qt. Backpack Vac were also interested in the following items. I use this vacuum in my house, it is by far the best vacuum cleaner I had ever owned. It is perfect to clean hardwood floors, walls, ceilings, vents etc. If I have to change something on the vacuum, I would change the connection between the plastic hose and the metal tubing. Purchased this vacuum to clean a large church. The staff loved it so much that I wound up buying a second one for another team. This vacuum is the best. It is so powerful and easy to use. This vac helps get the carpets prepped for scrubbing and I have my hands free so I can move furniture to vacuum under. Comfortable harness and the switch is easy to reach. 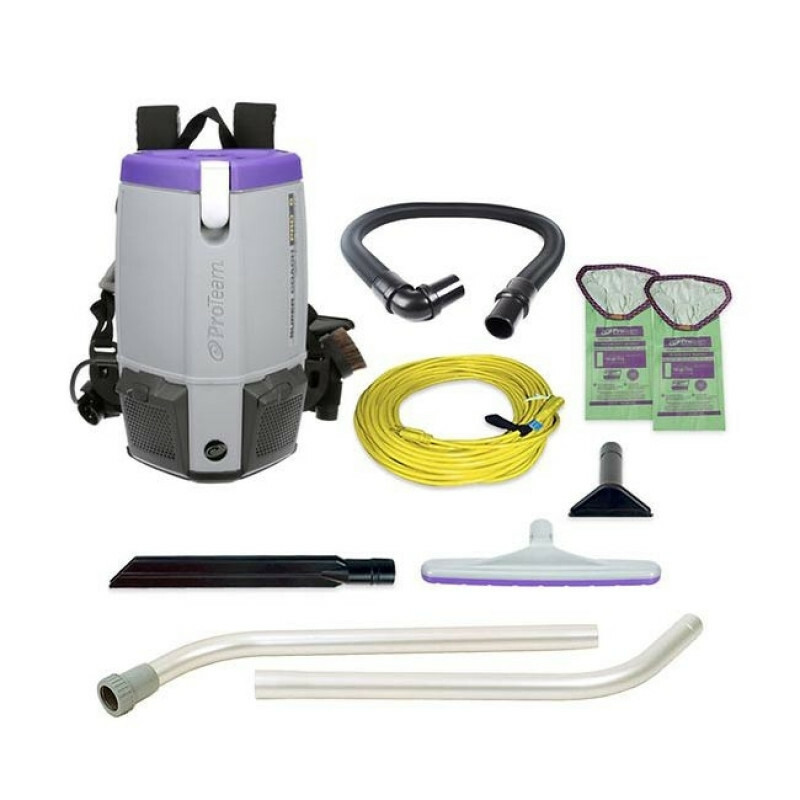 This is a review for the ProTeam® Super Coach Pro 6 Qt. Backpack Vac.